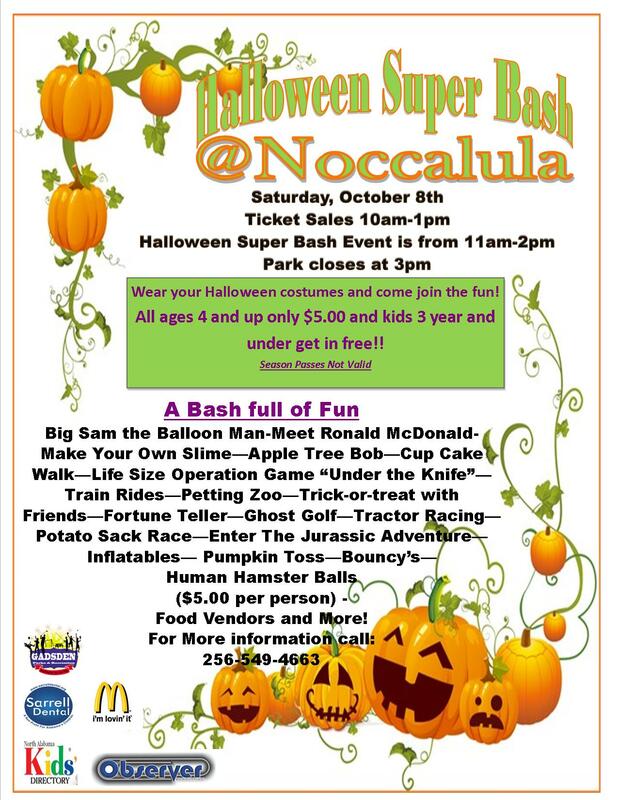 The Noccalula Falls Halloween Super Bash is a fantastic family friendly event. We’ll have food vendors, carnival games, inflatables, and of course, trick-or-treating. Wear your costumes to the event and get ready for some classic Halloween favorites like bobbing for apples, Pumpkin toss, homemade slime, and a fortune teller. The regular Noccalula Falls Park attractions will be open and participants will be able to enjoy Halloween themed stops at the Petting Zoo, train ride and more throughout the park. Tickets will be on sale from 10 a.m. to 1 p.m. Tickets are $5.00 for Adults and Children 4 years old or older. Children 3 or younger are admitted free. Season Passes are not valid for this event. A variety of vendors will be at the event including Human Hamster Balls, craft and food vendors with additional items for sale. For more information, call Noccalula Falls Park at 256-549-4663 and visit our Facebook page at https://www.facebook.com/noccalulafalls/ .